Is there a way to enable/disable the service from within the UI? If not I'd say this is a required feature. Great work guys, keep it up! Also, I thought I heard mention of a way to group displays, is this still in the work or am I just not understanding how it works? Agreed. 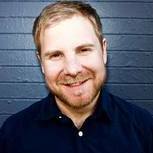 Hopefully this will be part of the 2.1 "tinker-y" update. Sometimes I don't need access to the other machines and just need to focus on the host machine at the time. Or if I'm trying to use snap functions in windows, photo editing on edges, etc. Why do you need to stop and stop the service so much? if you want to work on a single machine just lock the cursor onto that machine with scroll lock. Haven't thought to try that. Mostly it's due to how Synergy 1 worked vs 2. Just used to the Start/Stop functionality. Mostly it has to do with the laptops and moving their location frequently as well. I like the direction 2 went with simplicity but I still prefer a more direct on/off switch than Windows Services. just lock the cursor onto that machine with scroll lock. What do you exactly mean whith scroll lock? You mean the key from the keyboard? If so, the keyboard from my host laptop doesn't have this key. Is there any alternative for my case? Carlos I'm actually in the same boat. My Surface Book doesn't have the key as well. My desktop still does with the full size keyboard at least. I also wonder what would happen if I go to control the other machine since Synergy 2 now supports multiple host options. Might do some testing tomorrow. Yes I do mean the scroll lock key. It’s a function in synergy to lock the cursor and keyboard to whichever screen you are on. i know there have been some requests to enable key mapping so you should be able to use another key to do this a future release. Hopefully 2.1. Just tried out scroll lock. Very handy if you aren't side by side and the cursor is trying to fly off to the other machines. You can also scroll lock to each machine which is handy. Still an issue with laptops that don't have a visible scroll lock. If it's a W10 machine you can use the onscreen keyboard as an option but again that's still inconvenient. Toggle options for Scroll Lock and Start/Stop the service would still be nice additions. Part of it is the constant attempts to connect another system that may or may not be listening. It could show up as suspicious or nefarious network activity. That's why I'd like a start/stop panel feature, or at least a button in the GUI. It might as well tell the cloud server that that system is offline, let it notify the cloud server and my system in turn when it's back. I used the start/stop all the time when going into a full screen app (mostly for games) on my host machine. When in full screen mode, if I would pan to the left, my cursor would jump to my laptop, suspending the full screen app on my host machine. Though, I just tested the scroll lock trick, and it seems to keep my cursor in the full screen app just fine! Scroll Lock is a nice find. But same comments about no scroll lock on a laptop. Also, I clicked the on-screen keyboard and didn't see a Scroll Lock there either. It got annoying when I would be upstairs with my laptop and my son started playing games on my main PC which would keep changing the mouse focus. I have a mac laptop that I normally control from my linux desktop. But when I go into meetings I grab the laptop and want to break the control so I can see my mouse. Would be nice for a quick way to disconnect the client machine, I liked the systray icon. I shouldn't have to have the service running if Synergy isn't being used, it's that simple. Also Synergy 2 still has the sticky edge issue on my system so I don't want that buggy behaviour if I don't need it, but I shouldn't have to give that as a reason for easily stopping Synergy from running. Agree with the others about being able to start/stop the service. I've got a laptop that is at work, at home, at other places often. I want to use Synergy at exactly one of those locations. The other times, I don't like the idea of a service pinging out to the symless servers or the other computer once a second (or however often it does it). Every OS you support have a notion of starting and stopping services. The common pattern is a menu bar / toolbar icon that has context menu start/stop on it and the icon changes color or shape to reflect on/off-ness. What I would like is to be able to control all my systems from the map interface. Right click and have the option to delete a system (which will force a logout the next time they connect), or disable it (which doesn’t stop the service but removes it from the network so it can only use it’s own keyboard and mouse and I’m not flying off onto it). or clamp it (so all keyboards and mice are routed to it until it is unclamped. A system of key binds to do all this would be great but not necessary for as much as I would use them. I too work primarily on my laptop which goes with me from my home office, to my company head quarters, and to client sites. I don't need or want synergy running unless I have other computers to connect to. A novice user might not care about extra background processes running on their system unnecessarily but as a power user I don't like applications that keep running in the background, consuming system resources, after I've told them to shut down. 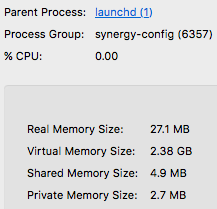 Closing Synergy 2 doesn't actually stop the application from running. 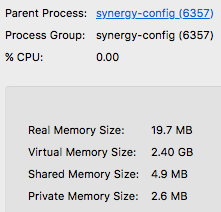 It continues to run in the background as synergy-config with a synergy-service sub-process, consuming CPU and memory when the user thinks it has been shut down. Ideally, on Mac, Synergy2 would have a menu bar icon like Synergy used to have that would allow me to manage my connections and to stop / start the daemon. I have to stop and start my service on the server A LOT. Realistically "A LOT" means more than I feel I should have to, but honestly only when I have removed one of the systems from the network and then rejoined it without killing the software (service, not the UI). It does not seem to do well with connecting back up to the other systems on its own once it should be able to see them again. I had a feature request thread removed without any reply recently too. Not what I expect from a company that I bought something from. I tried to report another issue yesterday, not on the forum, but directly to Contact section of the site and, after spending some time generating the log files and writing the text with the explanation of the problem itself, I found out the send button doesn't seem to work. I paid for using the software and now I cannot use it. I found out the send button doesn't seem to work. There's a bug on the contact form that affects about 1 in 1000 users, we're urgently fixing it.